*To redeem a voucher, please fill out the form on our Voucher page. 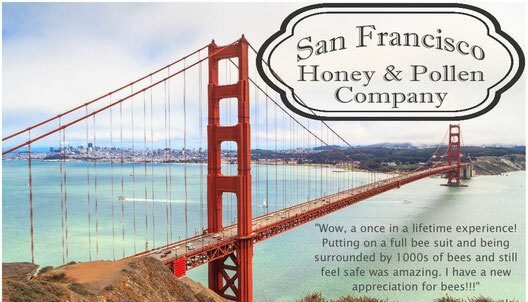 SF Honey & Pollen Co. was founded in 2006 by John McDonald. We currently offer Beginner & Advanced Beekeeping classes, open to the public, on the weekends here in San Francisco. John teaches with a very hands-on, "in the hive" approach. He teaches each class hoping that students walk away with a new understanding and appreciation of bees. Your day will be spent learning about the infrastructure of a well-running beehive, suiting up in traditional bee suits to go into living, working hives, and wrapping up by tasting various, locally produced honeys and pollen. SF Honey & Pollen Co. sells local, all natural, raw honey, all natural creamed honey, pollen, seasonal wax, and all natural bees wax candles. We have a variety of artisan flavors available. Our products are currently for sale at local markets here in San Francisco, CA.